Pileated woodpeckers (Dryocopus pileatus) are large woodpeckers common in forested areas throughout eastern, midwestern and western U.S. states and southern Canada. (Ref 2) They usually lay four eggs in nests built inside tree trunks. Both males and females sit on the eggs, trading off so that the eggs are attended at all times. They hatch approximately 18 days after they are laid. 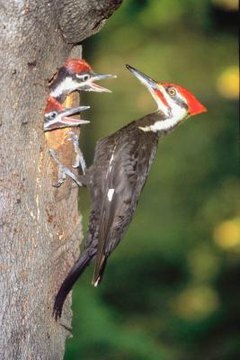 (Ref 2) If you want to see a pileated woodpecker family in your yard, you can build a nest box suited for them. Mark the board. Starting at one end, use a pencil to make a mark at 32 inches, 56 inches, 80 inches, 104 inches, 112 1/4 inches and 128 1/4 inches. Saw the board at each mark. The 32-inch board is the back panel. Two of the 24-inch boards are the side panels and the third is the front panel. The 8 1/4-inch board is the floor and the 16-inch piece is the roof. Discard the last piece. Mark the center of the front panel 19 inches from the bottom. Use the jigsaw to cut an entrance hole 4 inches in diameter, using the mark as the center. Drill four quarter-inch holes in the floor panel for drainage. Drill small holes at the tops of the side panels for ventilation. Nail the floor panel about a quarter of an inch above the bottom edges of the front, back, and sides. Orient the roof panel so that the long side forms an overhang over the entrance hole. Screw the hinge onto the back panel and the roof. The roof of the nest box will sit approximately 5 inches below the top of the back panel. Fill the box to the top with hard-packed sawdust. Attach the back panel of the nest box 20 to 30 feet high in a tree using lag screws and washers. Orient the entrance to the south or east.  Pileated woodpeckers usually excavate their own holes. A nest box packed with sawdust may mimic a natural hole and attract the birds more than an empty nest box.  A nest box placed within a stand of trees may be preferable to a nest box in a lone tree or one at the edge of a group of trees.